There is not much I can add to the saga of the F-16. It is currently the most popular fighter in the world with well over 20 countries operating the type. Over 3500 have been built and while the production lines for US planes is currently silent, it is still being built for overseas customers as well as having production lines in other countries overseas. The ESCI kit of the F-16 is really quite good, with engraved panel lines, a decent decal sheet, and a moderately well detailed cockpit and wheel well area. If you want to build for contests, then use the more detailed Hasegawa kit, but for 'normal' modeling, the ESCI kit will do nicely. Like all other F-16 kits, it assembles in the same manner with the fuselage being broken down into upper and lower halves. Also like other F-16 kits, the most troublesome area of construction is the intake area. The intake is divided in to left and right sections with the nose gear well incorporated in this section. This means a huge seam running inside the intake. It can be filled and smoothed with putty, but it is an awkward undertaking. Another troublesome section was the fit of the exhaust to the rest of the fuselage. It does not smoothly fit, so your choice is to putty it in or just leave it be. Due to accessibility problems arising from the speed brakes in the same area, I just let it be. The ESCI kit also comes with a nice selection of armament, comprising Sidewinders and bombs. There are also wing and fuselage drop tanks, so you can really load up your F-16. 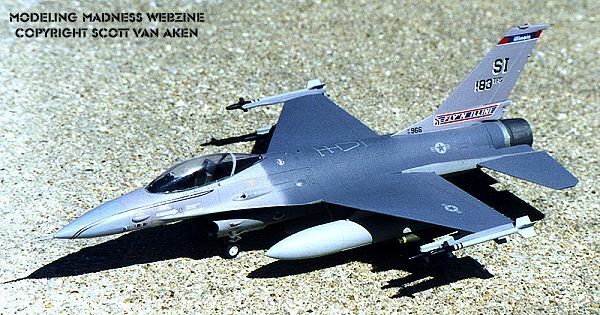 This F-16 kit is of a later 'A' model with the enlarged horizontal stabilizer, so you need to know if the plane you are modeling has this addition. Other than the initial production versions, most had this feature. As was typical of my building at the time, I would generally build several of the same kit and then give them each a different set of markings. At the time, I was into the ANG so that is what I chose for these planes. Don't let the difference in color fool you in these photos as there was different lighting used in them and that is why the color shift. I used Gunze acrylics on both of them in the colors recommended by the kit instructions. The exhaust was painted using Testor's Metallizer and a piece of Bare Metal foil was used in that area as well. Decals were by Microscale and used to depict aircraft of the 169 TFS Illinois ANG and the 138 TFS New York ANG. They went on well using Microscale's setting solutions. Since Gunze paints dry semi-gloss, I did not apply the usual coat of Future and had no problems at all with the decals. Overall, these are nice kits of the F-16. While it can be a bit fiddly for the beginner, anyone else should have no real problem with them.